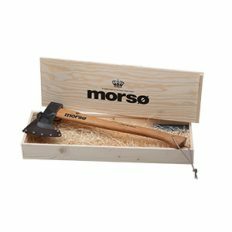 This is the axe we use here at the cookery school - made by our friends at Morsø, it's a beautiful hand axe with a linseed oiled handle made of first grade USA-Hickory wood, hard and dense with exceptional flexing strength. We use it for splitting the kiln dried birch into manageable and usable sizes for use on our woodfired ovens. This axe head is traditionally forged from C45 high grade carbon steel with a Rockwell hardness of approximately 53 - 56 HRC (According to DIN 7287/B). With proper care and maintenance your Morsø axe will last for more than a lifetime!